Cuba has been allocating resources and production, primarily through its centrally planned economy, which created an inappropriate labor incentives system, leading to deteriorating economic conditions (Pellet, 1976, 1986). These factors negatively affected Cuba’s economy. For example, the Gross Domestic Product (GDP) per capita in 1995 was $1,926 compared to $2,067 per capita in 1959 before the economy was transformed in the early 1960s (Maddison, 2003). Cuban agriculture’s contribution to GDP has decreased from 24 percent in 1965 to 7 percent in 2000 (Maddison, 2003). Many countries, including Spain, Canada, Mexico, Italy and Venezuela continue to trade and invest in Cuba. This implied that economic and other activites in these countries influence their direct investments in other countries. Countries have invested in Cuba including China, which is primarily the reason this study analyzed the characteristics of the country of the Republic of China that affected foreign direct investment (FDI) inflow to the Republic of Cuba from 1998 through 2007. According to Dunning’s theory of FDI in international production (Dunning, 1988a), a firm will invest abroad if the host country offers certain locationspecific advantages (LSA). These advantages can be classified into two categories according to Dunning’s (1988a) previous study on FDI. The first category is proprietary advanced technology and expertise offered by the country providing the FDI. The second category of advantages, provided by the receiving country, is a combination of vertical and horizontal integration, economies of scales, and an internal financial market (Dunning, 1988a). 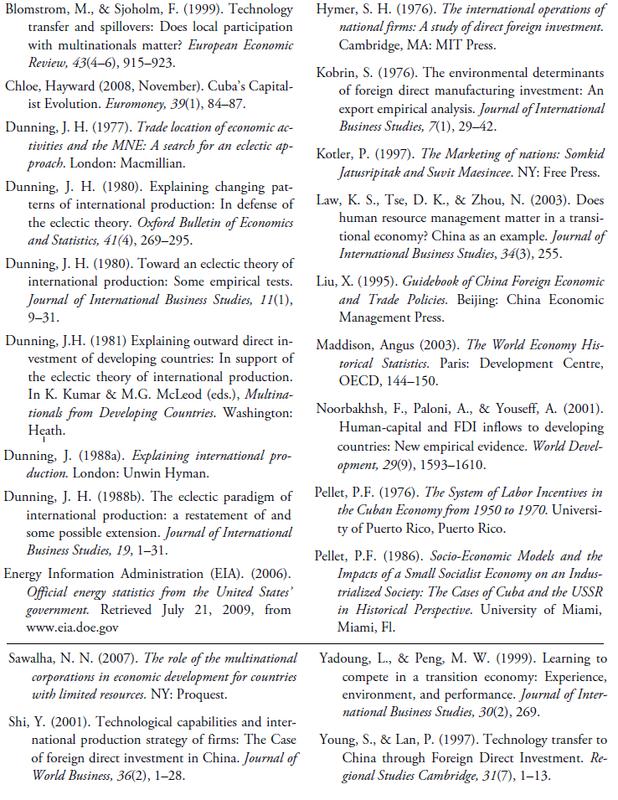 Dunning’s ability to integrate LSA has been widely recognized and embodied with the onset of globalization. The increasing ability to globalize the world’s economies has been influential by embracing innovation through the expansion of FDI (Dunning, 1988a). Countries with a stable economy and the ability to expand its own economy will attract FDI (Dunning, 1988a). Dunning’s theory has also been influential through the use of innovative technological resources such as computers and the world wide web, as countries compete for economic integration and expansion. The dominant ‘eclectic paradigm’ of international production, which relates to the characteristics of MNE’s (multinational enterprises) activity and the global economic scenario through FDI, offers a more comprehensible reason to set up production in a foreign country, since ownership, rival competition, and easy access to operating in a foreign country will allow further expansion over its competitors (Dunning, 1988a). Yadoung and Peng (1999) stress that in a developed economy, unskilled labor is not a distinctive resource and can be employed in the market without much networking effort. An investor in pursuit of cheap labor typically operates in an enclave, in which all the resources, except labor, are brought in from the home-based networks (Yadoung and Peng, 1999, p. 269). This is an important accomplishment that the Cuban economy must undergo by pursuing unskilled labor in order to receive FDI to expand economic development in the island nation. Local presence is also useful in building local relationships because it provides gravitational proximity to the foreign networks in which activities are centralized (Dunning, 1988a). Cuba has an abundance of local unskilled labor in which FDI is able to typically operate and mobilize its labor force (Dunning, 1988a). The ultimate purpose of FDI is for overseas investors to pursue complicated local linkages, procuring and allowing components, parts, services, research and development, and local financing to promote their migration in a foreign country (Dunning, 1988a). Hymer (1976) also stressed that in order to engage in international production in a given host country, a firm must possess substantial advantages that offset its natural disadvantages to promote international investment (i.e., cultural uncertainty and geographic distance) vis-à-vis domestic firms in that country. Another factor influencing FDI in the international market is the level of human capital in the host countries (Noorbakhsh, Paloni, & Youseff, 2001, p. 1593). FDI firms adapt their human resource management to powerful social public and private institutions in a transitional economy, such as the case with the People’s Republic of China, whose human capital has allowed FDI to penetrate the country’s financial institutions and grow within its transitional system, rather than FDI firms invading local institutions (Law, Tse, & Zhou, 2003). The objective of this study was to answer the following question: What macro factors from the People’s Republic of China impact FDI to Cuba? Gross National Income Per Capita: Measured by a country’s Gross National Income through GNI per capita (World Bank Economic Atlas) based on the country’s domestic monetary system. Financial Capital: Measured by gross fixed capital formation and gross capital formation (Dunning, 1988). Level of Technology: Measured by high technology exports and industry value added (Blomstrom & Sjoholm, 1999; Dunning, 1988a). Human Capital: Measured by school enrollment and total unemployment (Sawalha, 2007). Energy and Natural Resources: Measured by the ratio that offers certain location specific advantages (LSA) to a foreign country through energy use and fuel imports (Dunning, 1988a). Transportation and Communication: Measured by the ratio of total vertical and horizontal integration of local firms through air transport, fixed line and mobile phone subscribers and Internet users (Dunning, 1988a). Market type: Measured by merchandise trade (Dunning, 1988b; Kotler, 1997a; Porter, 1996). Environment Factors: Measured by agriculture value added, which has a direct and indirect effect of Multinational Corporations conducting FDI ventures (Kobrin, 1976). Governmental Factors: Measured by the worker’s remittances and employees’ compensation as it pertains to a country’s labor system. China’s mixed economy has grown and is rapidly growing. Its Gross Domestic Product (GDP) has grown considerably and is expected to increase beyond 9.9 percent per annum from 2005 (Energy Information Administration (EIA), 2006). Inflow of Foreign Direct Investment (FDI) into China totaled $86.1 billion in 2005, a new record, and twice the level of 2001 (EIA, 2006). China’s commitment to trade with foreign countries and to modify its once centrally planned economy to a mixed economy has opened the Chinese economy to privatization. China’s communist system of government remains in control of large State Owned Enterprises (SOEs), many of whom remain inefficient and unprofitable (EIA, 2006). China’s major investment has been the recent oil exploration that began in the 1990s, but has been fully implemented since 2006. Efforts have also been made to exploit onshore oil and natural gas fields in the Western providence of Xiniang, Sichuan, Gansu, and Inner Mongolia, as well as off shore fields in the Bohay Bay, Pearl River Delta, and South China Sea (EIA, 2006). Since 1979, China’s ability to attract advanced technology through FDI had been notable, with its open door policy of importing manufacturing technology into China and exporting manufactured products to foreign countries (Liu, 1995). China has benefited from the transfer of technology. First, there were benefits from proprietary advanced technology, such as patented technology and know how, brought in by foreign investors (Shi, 2001, p. 3). Second, there were advantages derived from synergies such as vertical and horizontal integration, which China was able to promote through technological transfer across borders through FDI (Shi, 2001, p. 3). China’s technological transfer can be explained using Dunning’s (1988a) base theory. A number of location-specific advantages (LSAs) led the way to advantages in the areas of natural resources, cheap land and labor costs, potential local markets and government policies that China was able to promote to attract foreign investors (Shi, 2001, p. 3). China was able to profit from a market for technology, which allowed the country to lure foreign firms to transfer advanced technology into China (Shi, 2001, p. 6). Therefore, foreign firms in China were able to utilize advanced technology and allowed to sell their products to local users through an import substitution scheme in addition to other preferential treatment (Shi, 2001, p. 6). The data used in the study were obtained for China from the World Bank, Freedom House (2000– 2001), International Labor Office Database, World Investment Report (UNCTAD, 1998–2007), World Resource Institute and United Nations for the period, 1998 through 2007. All hypotheses were tested using SPSS software. Multiple regression estimation procedures were utilized; as multicollinearity was significant, simple linear regression estimations were used instead. A simple linear regression analysis between FDI Cuba and GNI Per Capita for China did not reveal a significant relationship (β = 0.0119, p-value = 0.087, Table 2). As a result, there was not a significant correlation between the FDI to Cuba and the GNI Per Capita for China, implying the null hypothesis was not rejected. A simple linear regression analysis between FDI Cuba and the Gross Fixed Capital Formation for China did not reveal a significant relationship (β = 3.34, p-value = 0.115, Table 2). Therefore, there was no significant correlation between the FDI to Cuba and the Gross Fixed Capital Formation for China, implying the null hypothesis was not rejected. A simple linear regression analysis between FDI Cuba and the Gross Capital Formation for China did not reveal a significant relationship (β = 1.74, pvalue = 0.082). Therefore, there was no significant correlation between the FDI to Cuba and the Gross Capital Formation for China, implying the null hypothesis was not rejected. Hypothesis 3: FDI to Cuba was the dependent variable while High Technology Exports and Industry Value Added for China were the independent variables. Simple linear regression estimations were conducted for both models. A simple linear regression analysis between FDI Cuba and High Technology Exports for China did not reveal a significant relationship (β = 0.566, p-value = 0.389, Table 2). Therefore, there was no significant correlation between the FDI to Cuba and High Technology Exports for China, implying the null hypothesis was not rejected. A simple linear regression analysis between FDI Cuba and Industry Value Added for China revealed a significant positive relationship (β = 5.28, p-value = 0.021, Table 2). Therefore, there was a significant positive correlation between the FDI to Cuba and the Industry Value Added for China, implying the null hypothesis was rejected. This is a reasonable result, since Cuba has been considering adopting the China model for economic reform and strengthening FDI from China (Mesa-Lago, 2005). Also, Cuba’s main source of credit is China, who provided export finance to Cuba in the amount of 1.8 billion dollars in 2006 (Chloe, 2008). The relationship being significantly positive implies that as Industry Value Added in China increased, then FDI to Cuba would also increase. Hypothesis 4: FDI to Cuba was the dependent variable while School Enrollment and Total Unemployment for China were the independent variables. Simple linear regression estimations were conducted for both models. A simple linear regression analysis between FDI Cuba and School Enrollment for China did not reveal a significant relationship (β = 0.489, p-value = 0.358, Table 2). Therefore, there was no significant correlation between the FDI to Cuba and School Enrollment in China, implying the null hypothesis was not rejected. A simple linear regression analysis between FDI Cuba and Total Unemployment for China did not reveal a significant relationship (β = 3.57, p-value = 0.660, Table 2). Therefore, there was no significant correlation between the FDI to Cuba and Total Unemployment for China, implying the null hypothesis was not rejected for this country. Hypothesis 5: FDI to Cuba was the dependent variable while Energy Use and Fuel Imports for China were the independent variables. Simple linear regression estimations were conducted for both models. A simple linear regression analysis between FDI Cuba and Energy Use for China did not reveal a significant relationship (β = 0.0293, p-value = 0.111, Table 2). Therefore, there was no significant correlation between FDI to Cuba and Energy Use for China, implying the null hypothesis was not rejected. A simple linear regression analysis between FDI Cuba and Fuel Imports for China did not reveal a significant relationship (β = 0.0000, p-value = 0.070, Table 2). Therefore, there was no significant correlation between the FDI to Cuba and Fuel Imports for China, implying the null hypothesis was not rejected. Hypothesis 6: FDI to Cuba was the dependent variable while Air Transport, Fixed Line and Mobile Phone Subscribers and Internet Users for China were the independent variables. Simple linear regression estimations were conducted for all three models. A simple linear regression analysis between FDI Cuba and Air Transport for China did not reveal a significant relationship (β = 0.0000, p-value = 0.595, Table 2). Therefore, there was no significant correlation between the FDI to Cuba and Air Transport for China, implying the null hypothesis was not rejected. 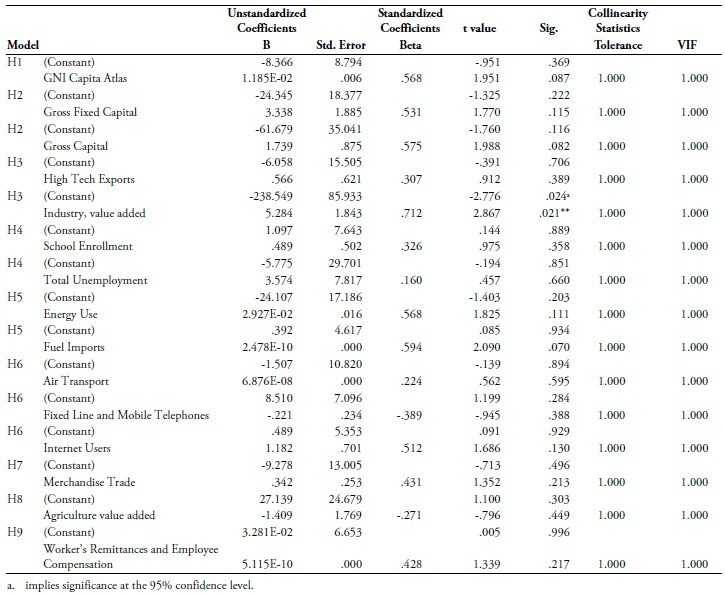 A simple linear regression analysis between FDI Cuba and Fixed Line and Mobile Phone Subscribers for China did not reveal a significant relationship (β = -0.221, p-value = 0.388, Table 2). Therefore, there was no significant correlation between the FDI to Cuba and Fixed Line and Mobile Phone Subscribers for China, implying the null hypothesis was not rejected. A simple linear regression analysis between FDI Cuba and Internet Users for China did not reveal a significant relationship (β = 1.18, p-value = 0.130, Table 2). Therefore, there was no significant correlation between the FDI to Cuba and Internet Users for China, implying the null hypothesis was not rejected. Hypothesis 7: FDI to Cuba was the dependent variable while Merchandise Trade for China was the independent variable. A simple linear regression analysis between FDI Cuba and Merchandise Trade for China did not reveal a significant relationship (β = 0.342, p-value = 0.213, Table 2). Therefore, there was no significant correlation between the FDI to Cuba and Merchandise Trade for China, implying the null hypothesis was not rejected. Hypothesis 8: FDI to Cuba was the dependent variable while the Agriculture Value Added for China was the independent variable. A simple linear regression analysis between FDI Cuba and Agriculture Value Added for China did not reveal a significant relationship (β = -1.41, p-value = 0.449, Table 2). Therefore, there was no significant correlation between the FDI to Cuba and Agriculture Value Added for China, implying the null hypothesis was not rejected. This is not surprising, as Cuba is not receiving a large volume of FDI for agriculture from China. Hypothesis 9: FDI to Cuba was the dependent variable while Worker’s Remittances and Employees Compensation (proxy for governmental factors) for China was the independent variable. A simple linear regression analysis between FDI Cuba and Worker’s Remittances and Employees Compensation for China did not reveal a significant relationship (β = 0.0000 p-value = 0.217, Table 2). Therefore, there was no significant correlation between the FDI to Cuba and Worker’s Remittances and Employees Compensation for China, implying the null hypothesis was not rejected. Hypothesis 3 was rejected. There was a significant positive relationship between technology in China and FDI inflow to Cuba. As China’s industries added more value, they were able to generate more foreign earnings and hence provided more FDI to other countries, including Cuba. The other eight hypotheses were not rejected. The data used were primarily from 1998 to 2007. The use of more recent data may provide different results, considering the increased global interest in Cuba. Other factors could be included in the model. These could be macroeconomic variables for Cuba, including GDP, inflation rates, interest rates, unemployment rates, income, and energy use, etc. The data from inside Cuba were limited and were not used in the testing of hypothesis. With more reliable data from Cuba, the analysis could be expanded. This study tested nine hypotheses using macro-variables from China to see their impact on FDI to Cuba. The study found that FDI to Cuba was positively influenced by China’s level of technology. This is a reasonable result. As China adopts more and newer technology to modernize its manufacturing plants and to increase efficiency, it produces more products for domestic and foreign markets. This generates significant profits and tax revenues, which can translate to more FDI to other countries, including Cuba. From the theoretical frameworks discussed previously, China had established operations with Cuba. This supported Dunning’s (1980) ‘eclectic theory,’ which explained the ability and willingness of a firm to serve markets (local, domestic, or international) and to exploit the available advantages. Dunning’s (1977, 1980) ‘eclectic theory’ explained that FDI firms were able to create vertical and horizontal spillovers of technology while expanding specialization of production. This study showed that the level of technology affected FDI to Cuba. The findings from Hypothesis 3, regarding the level of technology for China, also supported Hymer’s (1976) oligopolistic theory. Hymer (1976) indicated that the driving force for firms to expand abroad was the application of firm-specific skills or technology to a wide market, not only to reallocate the world’s capital. Furthermore, Hymer (1976) posited that markets were highly imperfect for firm-specific technology; therefore, well-managed local firms, drawing on their home court advantage, would be able to obtain greater returns on high-quality technology than distant firms hovering in unfamiliar territory (Hymer, 1976). For these particular reasons, those MNCs that were successful would undoubtedly penetrate and exploit their proprietary technology (Hymer, 1976). In the case of China, consistent with Hymer (1976) oligopolistic theory, by investing in Cuba and providing FDI, MNCs from these host countries would benefit from proprietary and high-quality technology. This was most notable for China investment in Cuba’s off shore oil exploration (Chloe, 2008; Mesa- Lago, 2005; Cuba economy, 2008). Hymer (1976) also posited that MNCs would provide FDI along with technology to developing countries and emerging markets. This study found that China viewed Cuba as a viable market for FDI. A bilateral approach could be studied. For example, a study could be done to see the relationship between FDI from Venezuela (Cuba’s largest trading partner) and Cuba’s economy. Furthermore, bilateral studies could be done with Cuba’s other existing trading partners like Canada, Mexico and Italy. 1. Editor’s Note: This essay was awarded Second Prize in the 2010 ASCE Student Prize Competition for graduate students. Orlando Villaverde holds a Doctoral Degree in Philosophy from Warren National University, a Master of Science in Aeronautical Science with a specialization in Management and a Master of Science in Business Administration. Dr. Villaverde also holds a degree in Business Administration with a Specialization in International Management and Finance (DBA) from Nova Southeastern University.